So, one of the comments received recently on this blog suggested I write an article on an individual. I thought about it, and then decided against it. I’m limited in what I can say, as I’m sure people have both good and bad opinions of this person, as they would anybody. I write about Cornell and groups that comprise it, but with the extraordinary exception of Mary Tomlan ’71, I generally limit myself in comments on individuals. However, I decided to take the idea and run with it in another direction, by revealing a little of the history of the founders who shaped much of the university in its formative years. This entry will cover Dear old Ezra Cornell himself. Any citations within the entry will refer to Morris Bishop’s History of Cornell unless otherwise noted. A lot of Cornellians know bits and pieces about the founders of Cornell. Dear old Ezra himself, born in 1807 in downstate New York to a quaker family (Bishop 8), moving to the Cortland County town of DeRuyter at 12, and then to the boomtown of Ithaca in 1828. According to Bishop, he was a tall, gaunt gentleman, disinclined to show emotion or to talk more than necessary. He married Mary Ann Wood in 1831 (12). Initially, Ezra made his living operating a flouring mill for Col. Jeremiah Beebe (flouring mills would ground up gypsum to be used in fertilizer). After the Panic of 1837 (akin to today’s economic crisis, only craploads worse), he lost his job and tried his hand at several ventures, including selling plows in Maine and Georgia, which failed (15). When he went back on another trip to Maine in 1843, he lucked out, and an accquaintance asked him to design a machine to lay telegraph lines. Being a self-taught mechanic, he built it, received a contract to lay the wire, became convinced it was bad method, and read up on electricity, coming to the conclusion that overhead wires were best (16). As a builder of wires, he made his fortune, and by 1849 had laid one-third of telegraph wires operating in the U.S. (17). Since he took his payment in stock, when Western Union bought him out around 1855, he was a made man. He went back to Ithaca, bought the land where CU sits today, and ran a model farm. He became president of the NYS Agricultural Society, and used some of his money to donate a library to Ithaca City (which was built at the SE corner of Seneca and Tioga it was demolished in 1960 as part of urban renewal. It was turned into a parking lot). He was the oldest member of the State Senate when he was elected in 1863 (persumably in the days before they had political gridlocks that accomplished nothing but gave everyone a mighty headache). It was here that he met A.D. White, when he was getting a bill of incorporation for the library (White, as the head of the Literature committee, had to approve the bill). I’ll be covering Andrew Dickson White in an entry in not too near future. ~Ezra was extremely self-righteous, which led to him being scorned by most of the Ithaca community. He was also extremely forgetful with regards to his debts, and his family’s needs (Bishop 13). People did not trust him, especially with money. For many years, his wife and kids had to live off her father thanks to his lack of provisions. ~He was apparently quite tactless as well. Col. Beebe, and later Samuel Morse (of Morse code fame) would have a hard time dealing with his demeanor. Beebe called him “coarse and impudent” (13), and Morse referred to him as “the plague” (17). ~Cornell hated Syracuse. He referred to as “that Gomorrah” (11) after he was cheated out of some wages when he was young. Kinda funny that A.D. White represented Syracuse in the State Senate. When White proposed using a large hill to the south of Syracuse, Cornell threatened to withdraw from the proposal unless the university was moved to Ithaca, which he had hopes of becoming a major city. Well, it didn’t, and the proposed hill was where Syracuse University established itself in 1870. ~Cornell’s vision of the campus was that of an industrial campus, egalitarian in nature. Namely, anyone could work their way through school, in the chair factory and shoe factory he proposed to set up on campus (126),like a trade school. One could not have been farther from the classical college educations of that time, or from A.D. White’s vision of CU. ~Perhaps tying to Cornell’s unorthodox nature, a Rochester newspaper concocted a story in October 1869 that Cornell sought to make a huge personal profit out the university (183). Doesn’t sound too different from the stories you find in editorials in the Ithaca Journal about how Cornell ruins the city. It came up again in 1873, when a Schuyler County legislator accused Cornell of defrauding the Morrill Act in order to make a $22 million profit, which resulting in a formal state invesitgation (it cleared Cornell in April 1874). ~Cornell loved to invest in railroads as much as he did his own university. His desire to make Ithaca a major city resulted in a constant investment in new railroads in and around the area, such as the Elmira-Ithaca-Cortland route and a proposed route to Auburn. He invested so much that White and Cornell’s attorney thought he might go bankrupt if something were to happen, like the Panic of 1873. Uncle Ezra lost a lot on those failed railroads (187). ~In what I can only describe as completely creepy, Ezra had nine kids , and sadly, one of them, Charles Carroll Cornell, died at the age of 4 in 1837. So Two years later, his wife had another son. They named him Charles Carroll Cornell. This child died at two years of age, so at least he never had to realize the utter sketchiness associated with named after one of your dead older brothers. Long story short, Cornell could be stereotyped as the rather crotchety old man who would scare small children at a glance and launch into stories of “when I was your age” to be shared with the students. The highest month, with 4,080 hits, was March 2009. It’s trailed off since then, probably due to a number of reasons, most of which have nothing to do with this blog itself. ~Weill Hall was formally dedicated, the last West Campus houses opened, Milstein was (formally?) approved, and the Animal Diagnostic Center, Hotel School Addition, and Physical Science building continue their trek to completion (as for the ERL project, I have no idea where that stands with regards to our economic issues). Speaking of which, a new construction freeze was announced, and $2 billion evaporated from the endowment. ~Over at I.C., the Williams Gateway building was completed, and the new indoor fitness facility is now awaiting the first signs of construction. IC and the city also learned that fireworks near the new Park School of Business building weren’t the best idea. ~In the city, the Cayuga Green Apartments were completed, while the condos still await construction. A 9-story hotel was announced for downtown, and the Collegetown moratorium expired, allowing the proposal of a 1200-bed project off of State Street. The Ithaca Gun plant was finally torn down, but not without persisting environmental concerns. ~In Greek Life, Alpha Omicron Pi deactivated its Cornell Chapter. Theta Xi moved around, and Psi Upsilon was reopened after its alumni had concerns with the current membership. Right now, it looks like Alpha Xi Delta might be moving around as well. A lot changes within a year. I hope that this blog has helped answer questions that people may have concerning Cornell U and its environs. To me, if this blog makes someone a little more knowledgeable or at least an interesting diversion, then it has done its job. I’m so glad she’s not running for re-election. Some Collegetown property owners are calling the potential historic designations of their buildings unsafe, unfair and an attempt to stop development. The city officials behind the list of historic resources in Collegetown say they’re trying to protect a legacy of beauty that will ultimately strengthen the city’s culture, economy and desirability as a tourist destination. Planning Board Chairman John Schroeder and Common Council Alderwoman Mary Tomlan, D-3rd, have compiled a list of 31 “Collegetown Historic Resources Worthy of Detailed Research.” Both the 2007 Collegetown vision statement and the proposed Collegetown Urban Plan call for identifying historic resources in Collegetown. The 31 resources, primarily buildings, are being studied this summer for a variety of historic recognitions, including potentially formal historic designation, which would prevent a property owner from tearing a building down and redeveloping it. Both the Ithaca Landmarks Preservation Commission and Common Council have to approve new historic designations. Joe Leonardo, owner of the Royal Palm Tavern, said some of the identified properties could be worthy of historic designation, but the Royal Palm is not one of them. “Why didn’t she (Tomlan) come to me and ask me what I thought? It’s going to decrease the value of my property because no one can develop on it if it becomes a historic landmark,” Leonardo said. “Is that my reward for keeping this business in the family for the past 70 years? They’re just anti-development, and it’s pretty transparent what they’re trying to do. Historic recognition is a part of good planning, tourism and economic development, Schroeder argued. “I’ve said throughout this that I strongly want and desire redevelopment of certain areas of Collegetown to happen,” he said, citing the 300 block of College Avenue as one he’d love to see redeveloped, and the east side of the 400 block as one that should be preserved. Historic preservation is important, but so is providing an adequate supply of safe housing close to campus, argued property owner George Avramis. His building at 403 College Ave. is on the list of historic resources. “(Having) older wood-frame buildings in that kind of densely populated area is, I think, a very dangerous approach to take,” he said. The building next door, 407 College Ave., burned to the ground in 1998 when a fire that started in a first-floor restaurant spread quickly through the building, he said. “Someday I would like to tear it (403 College Ave.) down and put up a nice, new, triple-A-fire-rated building, fully ADA handicap accessible, like 400 College Ave., the Starbucks building,” Avramis said. 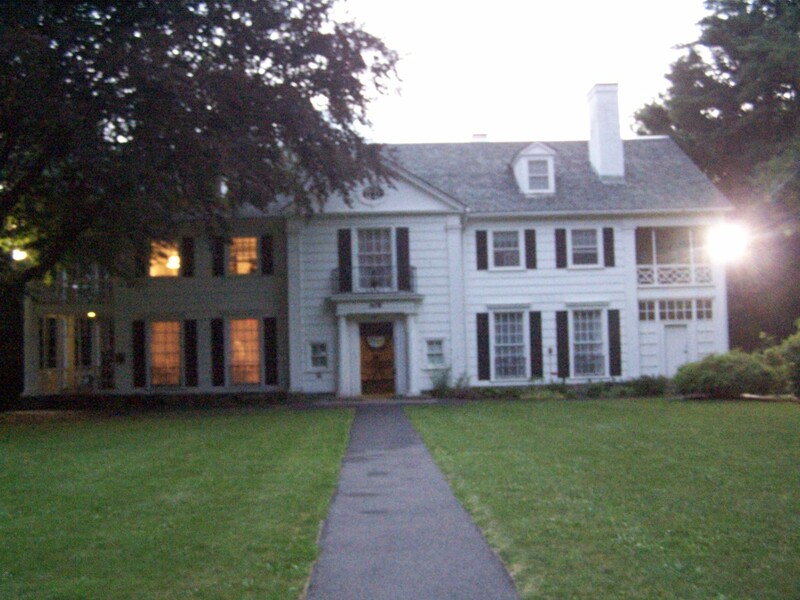 Sarah Iams lives at 116 Oak Ave., which is cooperatively owned by the Gamma Alpha Graduate Scientific Association. Iams said her biggest concern with the possibility of a historic designation is the extra time and effort involved in getting city approval for maintenance issues. Once a building is designated historic, any exterior maintenance or lot changes have to be approved by the Ithaca Landmarks Preservation Commission. Interior maintenance does not require approval. “As a graduate student co- operative that maintains the property ourselves, processes that might seem like small administrative hassles for a typical landlord or homeowner are a strong barrier to our successful operation,” Iams said by e-mail. Tomlan said she’s talking with city staff about setting up a public meeting in Collegetown sometime this summer for property owners and others to come learn about and provide input on the historic resources proposal. Alderman Svante Myrick, D-4th, is the only student on Ithaca’s 10-member Common Council, and he’s been the most vocal proponent for redevelopment in Collegetown. At 7 p.m. this Wednesday, Common Council’s Planning Committee will hear a report on the Collegetown Historic Resources list. They’re also scheduled for a public hearing and a vote on the Collegetown Urban Plan. The meeting is at City Hall, 108 E. Green St. The most recent version of the Collegetown plan is at www. cityofithaca.org. For the record, I want to say that I am not anti-preservation. I wholly agree with preserving Cascadilla Hall and the College Avenue Bridge, because of the historic and aesthetic qualities that they bring to the Collegetown area. That being said, the Palms is historic in the same way that a Ford Pinto is a classic car. So, I decided to have some fun and look to see which designations I agreed with on the historic recommendation PDF. As much as I dislike Tomlan’s views, I give her a lot of credit to her and John Schroeder (who works for the Sun?) for digging up the history behind the structures she recommended for preservation. If I didn’t write anything, it means I wholly agree with historic landmark status. 3. Cosmopolitan Club (301 Bryant Avenue) – This apartment house was the clubhouse for international students in the early years of Cornell, I wholly agree on its preservation, but maybe not on full designation, since that tends to make renovation difficult, and this building is severely worn down and could really use some work. 4. Royal Palms – Little historic value, apart from taking up a space. Extremely run down, possibly unsafe since it’s an old, large wooden structure, and a fire could be disastrous. Not only does it not deserve preservation, it deserves to be torn down. 5. A.D.White’s Eddy Gate – Derided in its own time for being an obstruction and for being ugly (see Bishop’s History of Cornell), this is already designated. 6. The Johnny’s Big Red Grill Sign – Already gone. 9. The Nines – What used to be the Collegetown fire station. 13, 14 ,15. 113, 116, 120 Oak Avenue. 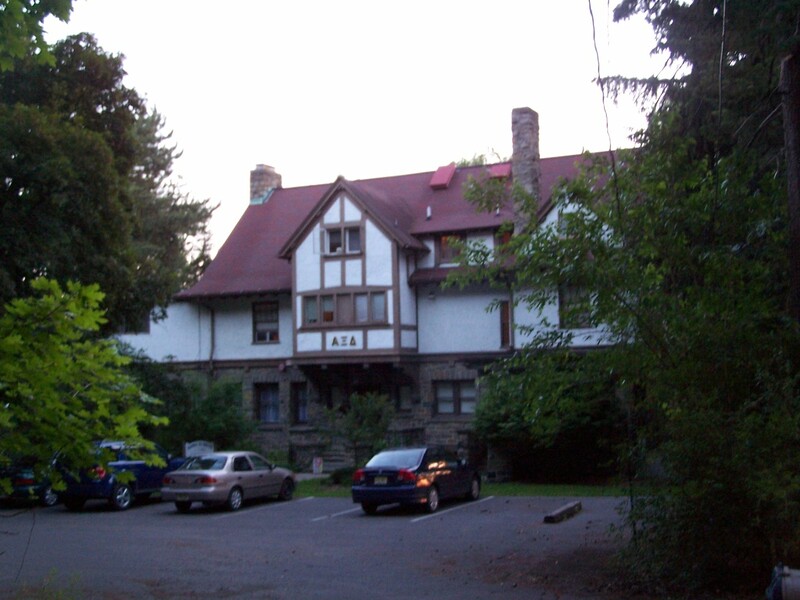 113 is one of the few actual fraternity houses that existed in Collegetown (Alpha Chi Sigma, from 1920-1955, when they moved to north campus). Today, the house is rented mostly by members of one of the honors fraternities. 116 and 120 face the gorge, and 116 is home to the biology grad student honors co-op Gamma Alpha. However, I have to disagree with historic designation. The two houses next to gorge would be extremely difficult to redevelop, and designation would make renovation difficult. As for 113, I would think it a shame to be torn down, but I wouldn’t argue against it. 16. The Larkin Building (403 College). Personally, I always considered this one part of the Ciaschi Block. Although Mr. Avramis argues that he wants to build a new building on the site, the current one fits in so well that he would have to go through raging hellfire to try and tear it down. My personal hope would be that he tear down the two-story brick s–tbox across the street where his offices are located. 17. Chacona Block (411-415 College Avenue) . Same case as above. I can imagine the preservationists would come out in droves if they tried to take this one down. 18-23. 103, 119, 121, 125, 127, 129 College Avenue. I can understand the historic value, but I fear that designation would harm the ability to renovate these structures. I would rather seen this handled such that if someone proposed something, that all due discretion is exercised. 24-27. 117, 119, 121, 123 Linden Avenue. Wholly against. My hometown, which built out in the 1920s and 1930s, is filled with these types of homes. They are of little historic value, and certainly not a “historic resource”. My inclination is to believe they selected these houses because there was recently a large property transaction in this area, so they’re trying to stop development here before it’s even proposed. 28. 120 Linden Avenue. At 140 years old, this may be the only house they have designated on this street that is worth giving landmark status. 29-32. They didn’t count the Big Red Grill Sign in the final total, so there were actually 32 desired landmark designations. The last four are trails and ruins, of little overall merit but of considerable aesthetic value. So, I completely disagree with five designations. I feel that many of the buildings have historic merit, but that historic landmark status might be going too far. However, this is why we have planning boards, so that people can vote down projects is they stand to be detrimental to the neighborhood. Rumor Mill: Alpha Xi Delta’s New House? Being in another part of the country sort of limits my ability to keep this blog as active as it usually is. That being said, occasionally some tip or rumor comes along, and if it piques my curiosity, I’ll sooner or later get around to addressing it. In this case, it would appear that popular rumor is ciruclating that Alpha Xi Delta sorority would be moving into Alpha Omicron Pi sorority’s old house. To make a long story short, AOPi closed this past year for a number of reasons, leaving their recently renovated (and rather luxurious, if I dare say) house on Ridgewood Road open. The house itself has a long storied history of being involved in the Greek system, with no less than four different Greek organizations calling at home at some point or another in its nearly one-hundred year history (see other entries). The rumor has its plausible points. For one, Alpha Xi Delta doesn’t own their house at 115 The Knoll. That house is still owned by Delta Phi Epsilon sorority, which closed about six years ago . Rumor mill seems to suggest that Alpha Xi Delta’s moving to Ridgewood may not be permanent, as AOPi stated that once the last sisters graduate (2011? ), the sorority is hoping to reactivate itself, persumably in the house it owns. I guess my question is, if the rumor turns out to true, then what’s being done with 115 The Knoll? Is Delta Phi Epsilon reactivating, or is the house intended for another purpose? I s’pose only time will tell on this one.